Be warned... Your Madagascar itinerary may be a long one. It takes a long time to get to Madagascar (at least it does from California!). Figuring what to put in and what to leave out is difficult because it is such a big and diverse island. Hopefully seeing what we did will help you make some of those decisions. 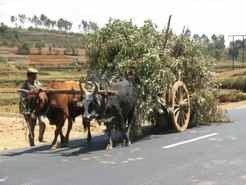 Our Madagascar itinerary called for us to arrive late at night in Antananarivo and leave early the next morning. We wanted to be sure we were there for the start of the tour, so we opted to arrive a couple of days early. ....things can sometimes go wrong. We think it's wise to plan for a little buffer time to make sure you don't miss the tour (or the boat or whatever). We felt our days in Tana gave us time to get over jet lag so we could dive right into the Madagascar itinerary our agency set up for us. We had wasted none of our tour time in Tana, so those days also gave us time to explore the city and it's environs on our own. Keep in mind that this itinerary just gives you an idea of how many days we spent in each location.... and how long it took us to get from one to another. The roads are bad and require long days of driving. Air Madagascar may not fly daily to all cities. And hotel space at most National Parks is limited, especially during high season... and you don't want to be in a rain forest during rainy season! All things to take into account when planning your itinerary to Madagascar. There are taxi buses all over the country if you are the hardy type and have plenty of time... but if you are planning a trip with a limited amount of time, the itinerary you end up with will depend on hotel and airline availability. I'll start our Madagascar itinerary with day 1 being the first day our agency took charge. Ready? Of course, we had already arrived, but since the Air France flight arrives at 8:00 pm at night, we were scheduled for one last night in Tana. A 10 hour drive includes a stop for lunch, picture stops and shopping if you want. It was a nice drive through rice paddies and rocky mountains. This road is one of the best in the country, but you still share it with trucks, taxi buses and zebu carts. 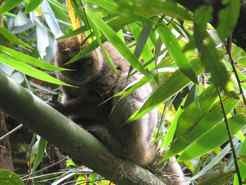 If you're lucky you will find the Golden Bamboo lemur and several others as you hike. Take an evening walk to seek the mouse lemurs, the narrow stripped civet, and chameleons. A 6-8 hour drive. This is also a pretty good road. The scenery changed as you cross the country and there are different tribes with different types of houses and different types of tombs. Photo stops and a visit to and "Antemoro paper" workshop at our lunch stop. Morning visit to Isalo National Park with its deeply eroded sandstone rock, swimming holes and endemic plants being more the draw than wildlife, though we did see a couple of lemurs and some chameleons. Picnic lunch. After lunch, a 4 hour drive through a range of fan shaped palms and a peek at spiny forest. Along the way you'll see some Mahafaly tombs in the area. Spend the night in Toliara/Tulear. Lunch at Fort Dauphin hotel then a 3-4 hour drive to Berenty Lodge. Stay at Berenty Lodge. Night walk to look for mouse lemurs and sportive lemurs. Morning walk to explore the tamarind gallery forest and visit the nice little museum they have there. 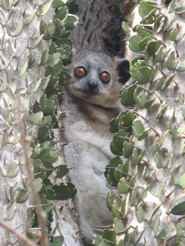 Lots of Ring-tailed lemurs and dancing Sifakas even around the lodge. Late afternoon walk in the spiny forest for more nocturnal lemurs. Stay at the Berenty reserve. You will miss something if you stay in Fort Dauphin to our way of thinking. After breakfast and a last view of the dancing sifakas, make the return 3-4 hour drive to Fort Dauphin for the transfer to the airport. Fly to Morondava for overnight. This is on the west coast, but we didn't linger to enjoy the beach. This is another 10 hour driving day on the trail to Tsimafana via the Baobab Alley. It's not that the distance is all that great... it's just that the road is that bad and there are a couple of memorable ferry crossings. It is different terrain again and interesting. Overnight at a Tsingy lodge. 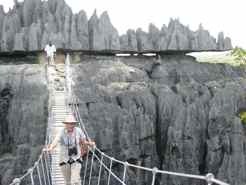 Day 10 Tsingy Allow an hour drive to the starting point to the hike the Big Tsingy. About a 4-5 hour hike through amazing limestone formations. In the afternoon, canoe on the river to see caves and cliffside tombs. 10 hour drive back to Morondava with a stop at Baobab Alley for sunset this time. Overnight in Morondava. Early morning flight to Tana. After lunch in Tana, a 4 hour drive to Andasibe/Perinet. The roads are better again, but there are lots of trucks traveling from the main port into and out of Tana. The scenery is great. Overnight at lodge in Andasibe. 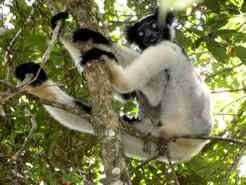 Wake up to the call of the Indri... the largest of the lemurs and the one with the justifiably famous call. This park was called Perinet under the French and still often is. 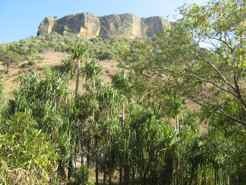 It's the closest to Tana and one of Madagascar's most celebrated reserves. Morning walk in the Andasibe section... a second growth rainforest to find Indri, Diadem Sifakas and other. In the afternoon explore the village. Early evening take a night walk to look for nocturnal lemurs, frogs and chameleons. Visit the Mantadia section of this national park. This is primary rainforest and an amazing site all by itself because there are so few undistured rainforsts left. Find more lemurs, rainforest birds, and frogs. Morning walk to Andasibe for a last view of the Indri and others. After lunch drive 4 hours to Tana... transfer to airport for night flight home. Day 16 We actually spent one more night in Tana because flights to Paris on Air France and Air Madagascar do not operate every day. We used the extra day to visit the crafts market (the Marché Artisanal) on Digue Road to buy last minute gifts and souvenirs. With our extra days at the start, our actual Madagascar itinerary lasted 18 days. We felt this was enough time to get a great overview. It was a long time for us to stay in one country, but there is so much diversity... and it's so far away... that we felt we needed to spend that much time. We hope this will help you with YOUR Madagascar itinerary. As we said before, it's a beautiful island that can use the help and money that good ecotourism brings in... so go for it!